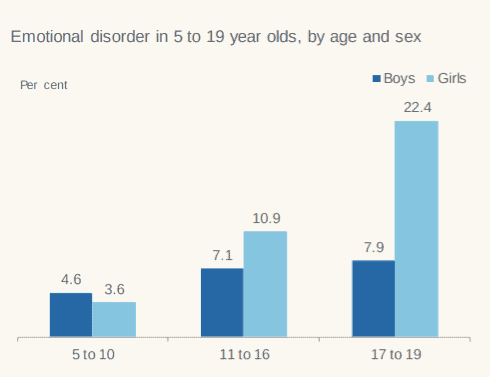 About 1 in 8 of 5- to 19-year-olds suffer from some form of mental disorder, a new survey conducted in the UK concludes. The situation is particularly concerning for young girls. The survey was carried out on 9,000 young people by the National Health Service (NHS) — the public health services in the United Kingdom. Similar surveys were carried out in 1999, 2004, and 2017, with slight age group variations. Unlike most surveys of the type, which rely on simple questionnaires or shallow assessments, this survey used a detailed and thorough methodology, involving clinically-trained physicians who followed the International Classification of Disease (ICD-10) diagnostic criteria. The mental disorders were split into our broad categories: emotional, behavioral, hyperactivity and other less common disorders. Emotional disorders were by far the most common type of disorder, but there are significant variations with age. 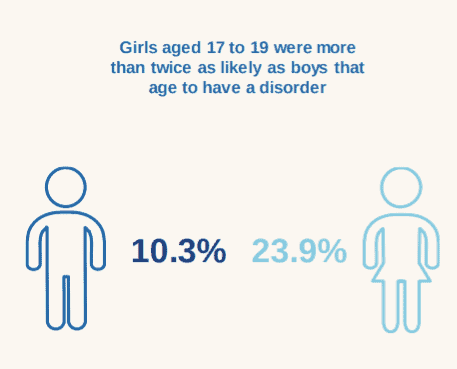 There was also a major variation by gender — at the youngest age groups (5-10 age group), boys were twice as likely to suffer from some disorder, whereas in the 17-19 age group, a whopping 22% of girls suffered from a disorder, compared to just over 10% for boys. This type of information can help introduce preventive policy at the most vulnerable groups, officials say. Rates of mental disorders increased with age: 5.5% of 2 to 4-year-old children experienced a mental disorder, compared to 16.9% of 17 to 19-year-olds. However, since the data acquisition methodology was also different between age groups, the different age groups should probably be treated separately. However, all age groups experienced a significant increase over time. 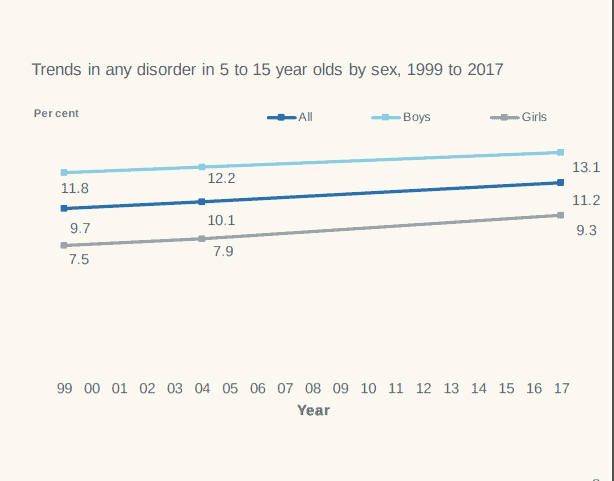 The prevalence of mental disorders in the 5-15-year-old group (which was analyzed in all surveys in this series) rose from 9.7% in 1999 to 10.1% in 2004, to 11.2% in 2017. The reasons for this growth are not clear, but as always, the social and family context is probably the most important factor. The rate of children with a mental disorder in a healthy, functional family is much lower than that of kids in a dysfunctional family. Tamsin Ford, one of the report co-authors, said that “a variety of family adversities” can be a part of the explanation, though many factors outside the family life can also be important. Aside from the usual suspects (drinking alcohol and smoking in teenagers, or the autistic spectrum, for instance), social media is a topic of growing interest — and growing concern. For instance, the survey revealed that 29.4% of kids aged 11 to 19 with a mental disorder spent more than four hours a day on social media — compared to just 12% of those displaying no symptoms. However, it’s not clear if there is a cause-effect relationship or even a significant association there. We need to better understand the causes and effects of the disorders, researchers urge. Over 1 in 4 teens aged 11-16 reported self-harm or a suicide attempt, and the long-term effects are presumably even more insidious and dangerous.